The Annan family and the Kofi Annan Foundation announce that Kofi Annan, former Secretary General of the United Nations and Nobel Peace Laureate has passed away. The Ghanaian diplomat served as the seventh UN chief for almost 10 years and was awarded the Nobel Peace Prize in 2001. Mr Annan was also the founder and chairman of the Kofi Annan Foundation, as well as chairman of The Elders, an international organization founded by Nelson Mandela. 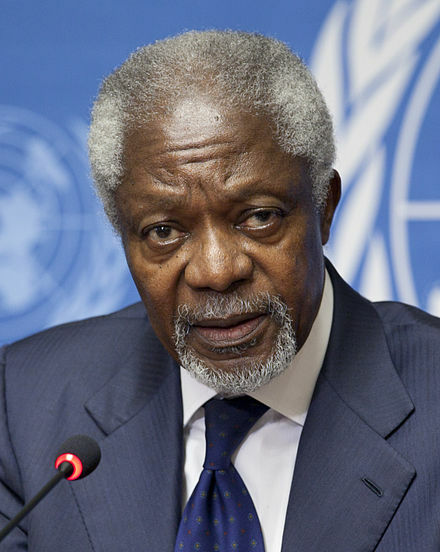 Annan joined the UN in 1962, working for the World Health Organization’s Geneva office. He went on to work in several capacities at the UN Headquarters including serving as the Under-Secretary-General for peacekeeping between March 1992 and December 1996. He was appointed as the Secretary-General on 13 December 1996 by the Security Council, and later confirmed by the General Assembly, making him the first office holder to be elected from the UN staff itself. He was re-elected for a second term in 2001, and was succeeded as Secretary-General by Ban Ki-moon on 1 January 2007. He is survived by his wife, Nane, and three children.